As you are starting to plan your day at Rottnest Island, you can rest assured that with Rottnest Fast Ferries, it is easy to get there! The 19 km of ocean is swiftly crossed on-board one of our ferries and in case you feel like taking your journey to new heights (literally), we have an option for you too! Your journey to Rottnest Island starts the moment you set your foot outside the entrance of your hotel. We understand the hustle of trying to get around the city without a car, therefore you should take advantage of our free buses! You can easily arrange to be picked up from 80 different locations in Perth including the CBD, Northbridge and Scarborough. The bus will then take you straight to the terminal in Hillary’s Boat Harbour, saving you the hassle of figuring out how to get to the ferry. When you are finally on-board, just relax. The ride over the 19 km of the ocean takes about 40-45 minutes under which we have staff that will help you during the crossing. We sell snacks and coffee on-board, everything to get your day started in the best possible way and if you want to get your daily news injection? No problem with our free WI-FI on-board! Coming from Hillary’s, Rottnest Fast Ferries has a much smoother journey than most other routes, but of course, nature is unpredictable and the crossing can get choppy from time to time. If you are one of the unlucky ones suffering from a queasy tummy while on-board on the ferry, our staff members will be on call and supply you with plenty of seasickness bags. If seasickness is not an issue for you, why not stretch your legs, grab a muffin and a coffee and walk up to the upper deck. Get a bit of fresh air and if you’re lucky, you might catch a glance of a whale flapping its flippers in the distance or dolphins trying to catch the waves? The ferry operates daily from Hillary’s with a variety of travel times. 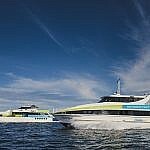 The first ferry is leaving Hillary’s at 7.30 am and the last ferry leaves Rottnest at 4.30 pm (7 pm on Fridays). Ever wondered how the world looks like from a bird’s perspective? Well, this is your chance to find out! Through Rottnest Fast Ferries you can book a helicopter ride with Rotorvation Helicopters. With flights available from Hillary’s Boat Harbour, you will experience astonishing views of Perth’s coastline, Fremantle and of course, an above perspective of Rottnest Island. The flight takes approximately 15 minutes and you’ll be arriving at Rottnest Airport, a 10-minute walk from the main centre. There is also a shuttle bus that can take you from the airport to the centre. Flights are available seven days a week with a minimum of 2 and a maximum of 4 passengers per flight. You can choose between one way, return and helicopter/ ferry packages, ensuring that there is something for everyone. Ever heard of our Heli – Ferry package? At Rottnest Fast Ferries, we offer a helicopter ride to Rottnest, and a Ferry ride home. So you get the best of both worlds! Western Australia has the highest per capita boat ownership in Australia, you may be lucky to have a friend with a boat that can take you to Rottnest? Taking your own boat to Rottnest is a perfect way to discover the beaches and the bays and gives you a bit of extra freedom to experience the island on your own terms. However, before you depart on a day full adventures, it is important to understand the rules and regulations that comes when visiting an A-class reserve like Rottnest Island. The island is home to some of the most pristine reefs, beaches and bays in the world with an overall of 450 species of fish and 20 species of coral. To respect and protect both wild- and marine life is important. To conserve this special marine environment, anchoring and admission fees apply to boats visiting the Island. Admission fees contribute to the conservation of Rottnest Island and maintenance of facilities and services. Sanctuary zones, no boating areas, speed limits and other guidelines are in place to balance recreation activities with the natural environment. To get a brief overview of the restrictions and regulations, we suggest you take a look through the “Marine and Boating guide for 2018-2019“. The information in the guide ranges from information on mooring and anchor systems to information about waste management, where to fuel up and what to do if you need help. The guide also contains contact information to relevant authorities. Definitely worth the read. You can find additional information on rottnestisland.com. A visit to Rottnest, or Rotto as the locals call it, is a must! Whether you choose to travel on-board one of our ferries, seeing the world from above in a helicopter or hitching a ride on a boat, make the travel experience just as unique as the visit to the island itself! Are you unsure what to do once you’re on the island? 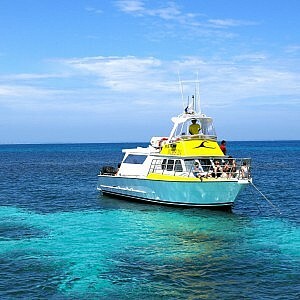 Read our Day At Rottnest article.